Upon arrival, the Charleston anchored mid-channel north of the (original) Steel Bridge. Officers and crew were ferried to the rose bedecked Stark Street dock while Portlanders arrived by the launch load to the sound of the cruiser’s Marine Band. The visitors were treated to tours of the bridge, wheel-house and decks, with up close views of the ships six and three inch caliber gun batteries. For sailors, the city waited with its festivities and many entertainments that included, but were not limited to, the block long bar at Erickson’s Saloon and a civic reception at the Portland Hotel. Sleek and fast, the U.S.S. 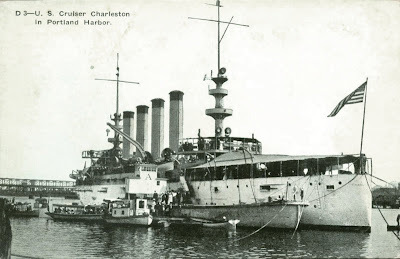 Charleston was a recent addition to Theodore Roosevelt’s modern steel-hulled navy. It was painted in the white garb soon to be made famous by “the Great White Fleet” of battleships and cruisers dispatched later that year by the President to show the flag (and newly acquired military might) on a three year voyage around the world. 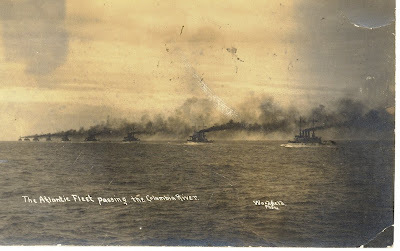 The “Great White Fleet” passing the mouth of the Columbia River on May 18th 1908, the closest it came to Portland, on the second leg of the world cruise, a round trip from San Francisco to Puget Sound before continuing on to Asia. The U.S.S. Charleston in Portland during the "Rose Carnival." Note the tall trees on the bluff to the right, where Overlook Park is today, the last of the original forest that covered The Peninsula. (click on images to expand). Aboard the Charleston was Admiral William T. Swinburne, who had chosen the cruiser for his flagship. He was suffering from rheumatism in a knee, aggravated by a recent tennis game, but was expected to be able the Rose Carnival’s committees planned events. Arriving from Washington was Commodore F.E. Beatty, the Charleston’s new captain, who took command of the ship in a ceremony that took place at its mid-river anchorage. As the week wore on, the Rose Carnival ran its course and the sailors returned to their ships. The U.S.S. Charleston and U.S.S. Paul Jones steamed down the Willamette and Columbia rivers to resume duty with the Pacific Squadron. The mutual admiration between the city and the navy brought on by the visit was enough to establish the tradition of the Rose Festival fleet which continues to this day. The U.S.S. 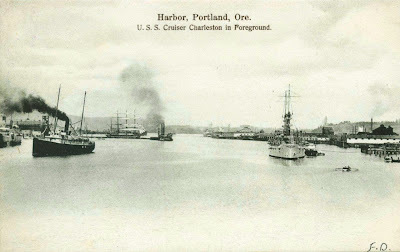 Charleston in Portland Harbor. The hull of this, the first Rose Festival ship still exists, run aground, used as a breakwater at Kelsey Bay on Vancouver Island. 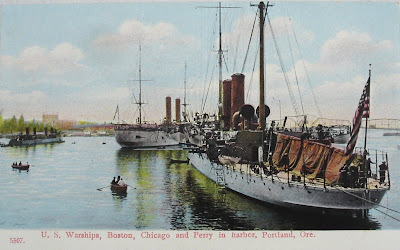 The white ships of the navy would be a regular sight in Portland harbor until the start of World War I, when the U.S. Navy would follow Great Britain’s lead in painting their fleet “battleship” gray. 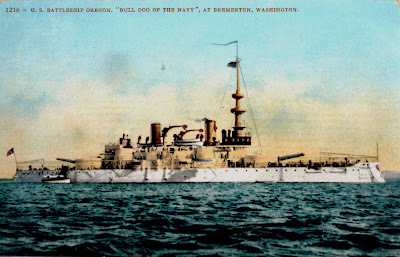 The best known of Portland’s early navy visitors, the Battleship Oregon was laid up in reserve at its Bremerton Washington base in 1907, the year of the Rose Carnival and the start of the Great White Fleet’s voyage. Only eleven years old, the famed veteran of the Spanish American war was already obsolete due to the armament innovations that followed the launch of the H.M.S. Dreadnaught. 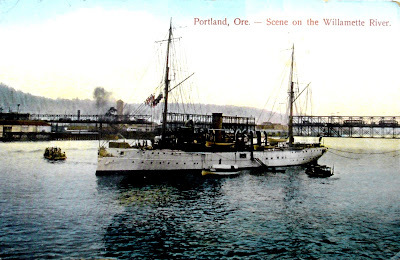 The Oregon returned to service in 1911 as a training vessel in San Francisco and visited the Rose Festival in 1916. 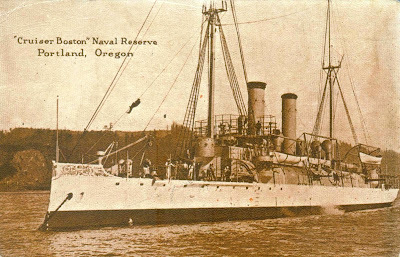 During World War I the Oregon was flag ship of the Pacific Fleet. After the war the U.S.S. Oregon visited the Rose Festival a final time in 1925 before being donated to the City of Portland (later to be donated for scrap during World War II). 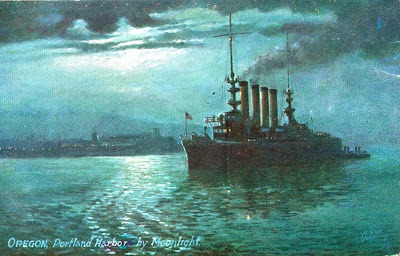 An unknown navy ship in Portland Harbor. Note the tower of Union Station and the original Steel Bridge. The Cruiser U.S.S. 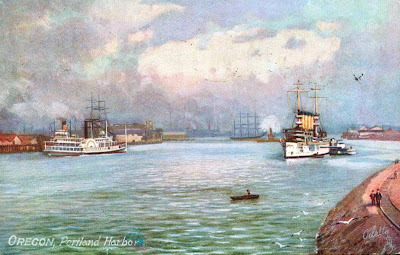 Boston spent a lot of time in Portland, especially during the Lewis and Clark Expostion in 1905. Awesome :D I love reading about old Portland..
My dad was there aboard the USS Oregon as a member of the Marine Detachment. The ship had cruised up from San Francisco were it was at the Panama-Pacific International Exposition was to celebrate the completion of the Panama Canal. I really want to appreciate you for this blog because it provide great thought. Thanks for this blog.